Alders Ledge: "They Turn You Into A Racist"
Roma or Romanian? Doesn't really matter much in Italy. In America a child born on United States' soil is automatically born an American citizen. In Italy a Roma born upon Italian soil is not an Italian citizen. It doesn't matter if the child is born to parents who were also born in Italy. The fact that they are Roma puts them into a state of "political limbo". Their ethnicity automatically denies them citizenship to the country in which they were born and raised. Many Roma children in Italy can look back at their ancestry and find generation after generation of Italian born Romany ancestors. Their fathers were Italian and their father's fathers were Italian. But they are not... not according to the Italian government that is. If you look at any Roma who have been long term residents of Italy you will not be able to find much of a distinction between them and other Italians. Of course their skin color might be a little off white I suppose. But their hair, their clothes, and their language are all Italian. The quote I started this post with however shows the distinction white Italians seem to be making between themselves and the Rom. It is a distinction that ironically does not apply to the difference between a Romanian and a Roma. So I will be making that distinction for them. The Romany are an ethnic group with vast differences between one group of Roma in one country and another group of Roma in another country. One might even notice a distinct difference between a family of Roma living in one house to the family of Roma living in the next. But that difference can be said to exist between any group of people from any ethnic or nationalistic background. The thing that makes a Romanian different from a Roma is the fact that a Romanian is a person of any ethnic origin who happens to be a Romanian citizen. A Roma is a person of Romany ethnicity. So the main reason for race baiting in Italy does not persist from the idea that Roma immigrated to Italy (some as far back as the 14Th to 15Th century) but from the fact that the EU's borders are "open". With the gates having been flung open and the ascension of Romania and Bulgaria to statehood in the EU the flood of immigrants began. Romanians hungry for work and a chance for a better life rushed into the Western Europeans' world. Italy was no exception. Other immigrants have appeared in recent years as northern Africans have begun flowing into Europe. They seem to have favored France and Italy as places to settle. Muslims from the Middle East have also taken to the two xenophobic states. And this is what has led to Italian resentment of all immigrants. The Roma are just setting between a rock and a hard place. If they leave Italy, their long lived home, they become immigrants in other neighboring countries... countries that also resent immigrants. If they stay they remain the "targets of opportunity" for the ever increasing xenophobic Italians. Hungary currently holds the presidency in the EU. They have made the Roma a priority in Europe. A priority group to be dealt with in a way that Europe has only promised for nearly a decade now. Hungary wants to address the crimes the Roma have been forced to suffer at the hands of European states and to fix the issues these mistreatments have caused. 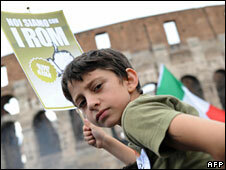 After that they want to integrate Roma into the European societies in which they currently live. And this is the issue with which they will most likely meet the most resistance. It has been a long standing policy in Italy, France, and neighboring countries that the Roma can not be integrated in their societies. This past summer they (and even Germany) proved this point by deporting Roma they accused of being in their countries illegally. The fact was that none of the deported Roma were ever proven to have been illegal immigrants. But that wasn't the point... France and Italy proved they don't want Roma in their countries. These countries have however shown that they believe countries like Hungary, where Roma have suffered attacks, should be integrated there. They just don't seem to believe that the Romany should be allowed to enter into the Western societies. So how can Hungary force these xenophobic countries into the "multicultural" utopia that the "progressives" in the EU Parliament dream of? History shows us that in a time of economic depression that the people of Europe seem to seek out nationalism in its worse form. They crave a "white" Europe when times go sour. And that is what we are witnessing right now. A Europe that is suffering from a new strain of xenophobia. The only way Hungary can stem the tide of the far-right in Europe is to first purge itself of political parties like Jobbik... a party that is growing in Hungary. It must then make it a mission to fight and destroy the new jackboots in the EU government itself. From its seat of power in the EU it needs to destroy the "tolerance" of antisemitism in places like Holland. And it must force countries to punish and isolate the new Nazi style groups in Europe. However we will most likely not be seeing that aggressive of a policy coming out of Hungary. We will be lucky if we even see them accomplish anything that the EU has promised the Roma since 2005. Thank you for your comment "anonymous". My reply would be more polite if you had left your name. However, since neither I nor the BBC could find where in Italian law the courts offer the child a "citizenship" of any sort I reported the situation as such. The issue I pointed out was the fact rather that Roma can be of Italian origin and still not be granted Italian citizenship. Even the Italian government has admitted to this "anomaly" when questioned by Amnesty International. Plus, had you read the post all the way through I did admit that this was a point made from an American point of view... we allow children born in our country to claim citizenship to our country. And I admitted that this may be a unique law to our country alone. Discrimination against Roma is not just the law in Europe. It is a socially accepted aspect of European life.